Looking to buy indoor bike trainers for your indoor rides but unsure which model suits you? In the past 2 years, the demand for indoor bike trainers has grown significantly as more and more cyclists jump onto Zwift and Trainer Road to bring their training to the next level. You’d probably be asking, would it be a wise move to get a smart trainer? Or if you’re on a tight budget, which smart trainer? Or perhaps just a dumb trainer if Zwift is not your thing. Rollers vs Trainers – Which one Suits You Better? Below you can find 8 of the best indoor bike trainers – both smart and dumb trainers. 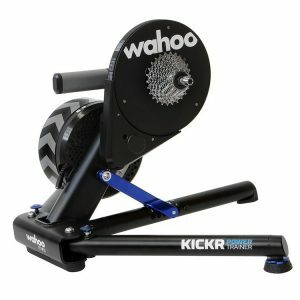 When it comes to the best overall trainer to connect to Zwift, most trainers pale in comparison to the Wahoo Kickr. 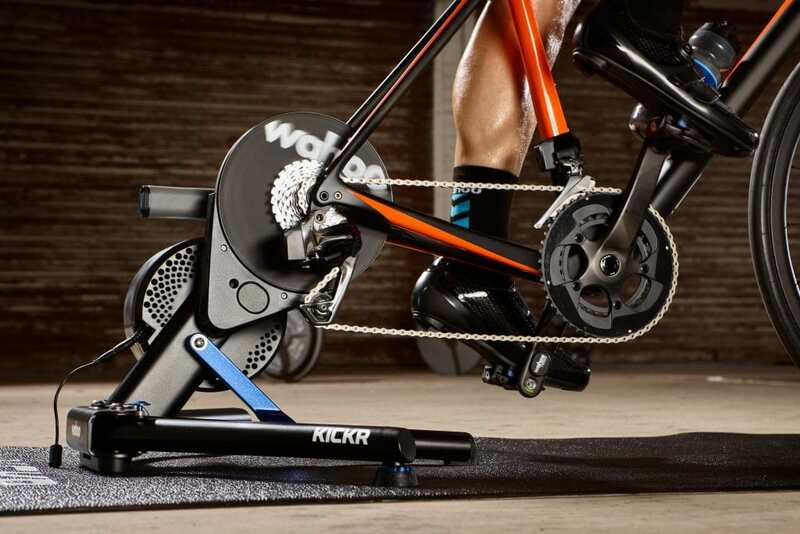 The Wahoo Kickr offers the ultimate indoor bike experience. It provides a plethora of options such as Kickr Climb, a grade simulator, and even a headwind simulator, known as Kickr Headwind. Its power ceiling is rated at a whopping 2,200 watts, which means you’ll never feel limited in your training. Its sensors guarantee that your ride experience is as close to the real deal as possible. It boasts a wide range of connectivity through Bluetooth, ANT+, and ANT+ FE-C. The Wahoo Kickr offers a near silent design, perfect for those who don’t want to hear the noise produced in wind/magnetic/fluid-based trainers. This is the ideal trainer for those who don’t mind a hefty price tag and desire the ultimate riding experience. There’s always a reason why riders need a truly quiet trainer. This is for those that just became a parent, those that live in a small apartment with thin walls, or those that just can’t stand the noise of indoor trainers. 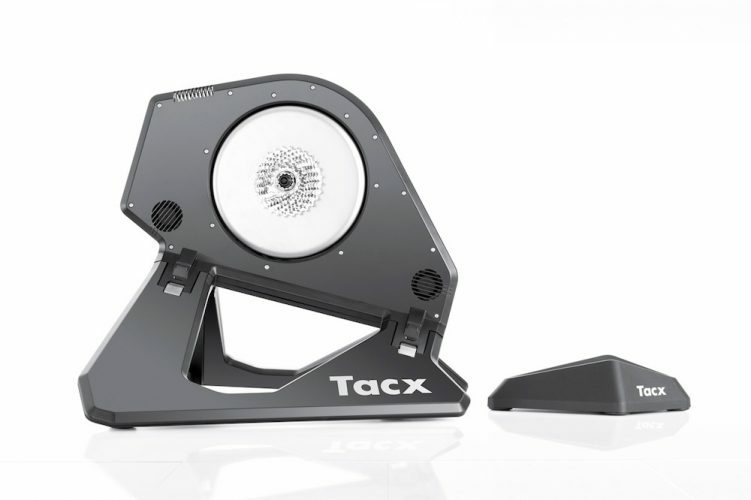 The Tacx Neo is by far the quietest smart trainer on the market. Its revolutionary design allows for it to run wireless or hooked up to a power outlet, making it perfect for those on the go. Although it weighs 47-pounds, its a breeze to store due to its compact frame design and foldability. It can quickly connect to Apple and Android devices through in connectivity features. It’s a direct drive system which allows for an excellent ride feel that even includes dynamic inertia and descent simulation. This is the best smart trainer for those that absolutely must have peace and quiet during their training rides while also retaining the features that make for an excellent ride. So you want all the bells and whistles, but you don’t want to pay the top price? Look no further, this is where the Elite Direto smart trainer shines. The Elite Direto boasts an integrated optical torque sensor power meter with high accuracy. A pedaling analysis option is available to hone in on the perfect spin. It comes with an in-house training app that records your training efforts. Just like other high-end smart trainers, the Elite Direto offers Bluetooth and ANT+ FE-C capabilities. It’s a direct drive style trainer so you can be sure that you won’t be wearing out any tires. This is a slightly heavier option, coming in at 43-pounds. Its broad base assures its riders that they will stay put while putting down tremendous efforts. 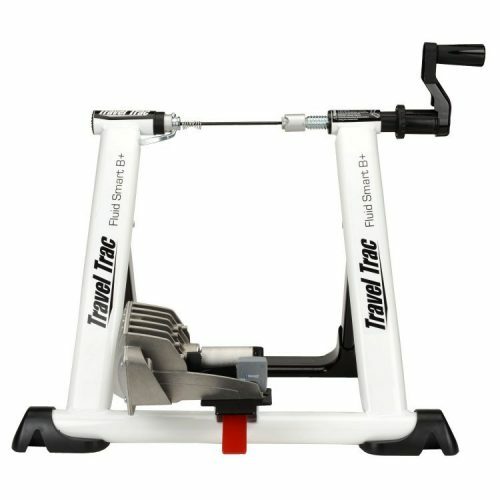 This is the best trainer for those who want the flexibility of high-end trainers, but also want to save a bit of money. Wahoo strikes again, this time with the Kickr Snap. Coming in at a stellar price point of $530, the Kickr Snap offers everything you’d expect in a smart trainer. This trainer boasts connectivity to just about everything, such as power meters, Kickr Headwind, Kickr Climb, and third-party apps like Zwift. It utilizes Bluetooth, ANT+, and even ANT+ FE-C to guarantee that your smart trainer can connect to any device. The Kickr Snap weighs in a 38-pounds, and is readily deployable in a “snap.” The resistance method is an electromagnetic system that creates a silent environment and plush road feel. The Kickr Snap is made from high-strength carbon steel to guarantee its durability and rigidity when in use. This is the best trainer for those looking for an extremely affordable trainer without wanting to compromise features. The Travel Trac fluid trainer is the best model for beginners because of its ease of use, fluid-based design, and overall modest price. This model will get newbies in the saddle when conditions outside prove unrideable. The Travel Trac allows users to put maximum power efforts on its smooth fluid system, without compromising resistance. The Travel Trac offers quick release skewers to rapidly mount or dismount a bike with ease and accommodates most road and mountain bikes. It’s small size packs away quickly and makes storage a breeze. This model weighs in at 30-pounds. This is the perfect trainer for beginners looking to get their first indoor trainer. 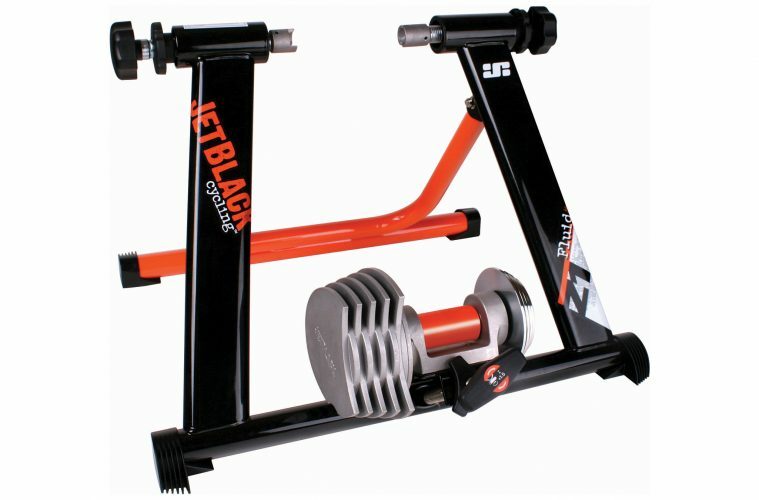 The JetBlack Z1 Pro is the most compact trainer available. This model is 40% slimmer than its competitors and weighs in at 29-pounds. When folded, the JetBlack Z1 has the lowest profile of any trainer that we’ve reviewed, making it the most compact trainer. Considering its fluid design, the JetBlack offers its users to put down a high-intensity effort without generating high noise or heat. This trainer is ready to use right out of the box, just connect your bike and get riding. The JetBlack fits a wide range of road/mountain bike tires to increase its overall compatibility. This is the best trainer for those who need the most compact trainer available. The Elite Novo Force is a high-end magnetic-style trainer. It’s equipped with an elastogel roller that makes for a pleasurable ride. The elastogel roller effectively reduces noise and tire wear, while increasing tire grip to avoid slippage. The Elite Novo also allows users to cycle through 8 levels of resistance to give a wide variety of scenarios. It will enable a power output of 690 watts so riders can have a high ceiling when making high-intensity efforts. It’s widely compatible with both road and mountain bike wheels. The Elite Novo Force even employs Misoru B+ Sensor, a Bluetooth capable device that allows connectivity with third-party apps. This is the best trainer for those looking to mimic the feeling of riding on the open road. 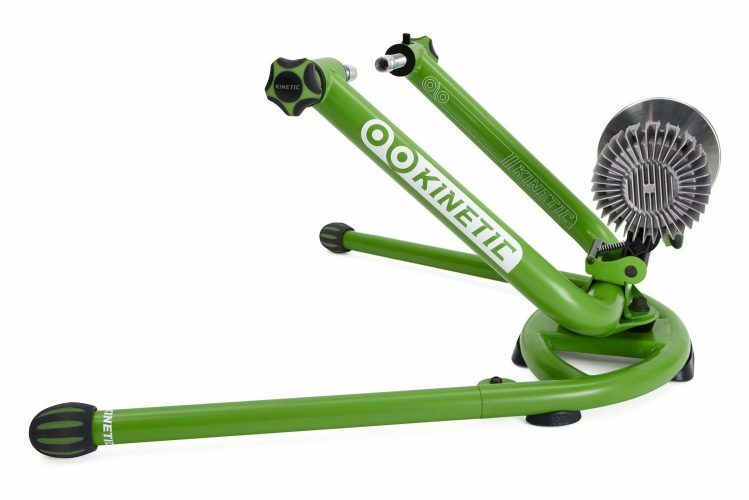 The Kinetic Rock and Roll trainer is a revolutionary design that allows its riders to stand up and sprint for those all-out efforts. It’s one of the only free-moving fluid trainers that simultaneously connects with app-based training programs through ANT+ and Bluetooth. It comes equipped with an inRide sensor that allows for connectivity to apps such as Zwift. It’s compatible with nearly all bike types, and Kinetic also offers a thru-axle adapter if needed. The Kinetic Rock and Roll features a broad support base for those sprint efforts to keep you stable while out of the saddle. It’s 29-pounds, which is on the low end of the spectrum regarding weight. If you’re looking for the best trainer for putting the pedal to the metal, this is the trainer for you. The benefit of the wheels on bike trainer is that drivetrain compatibility is a non-issue. All you need to do is clamp your rear wheel onto the trainer. Another significant benefit is the wheels on design tends to cost far less than their direct drive counterparts. This is because you don’t need to buy an extra cassette. Wheels on trainers are also smaller in size and weigh lesser. This is a significant benefit because they can be quickly stored with ease when not in use. The main downside of a wheels on trainer is the occasional wheel slippage. Generally, slippage occurs during high-intensity efforts which can affect your training session and keep you less engaged. You’ll also need to run a slightly lower tire pressure and ensure that there’s just enough contact between the tire and the trainer wheel. These days, there are various bike tires that are designed specifically for wheels on trainer. They are thicker and more durable compared to the standard road bike tires. Some of the popular wheels on trainers include Wahoo Kickr Snap (a smart trainer) or the Jetblack Z1. PRO TIP : Wheels on trainers are ideal if you’re just starting out, have a tight budget and won’t be doing any hard efforts on the trainer. Direct drive trainers has a realistic (or close to) road feel. There isn’t any tire slippage unlike the wheels on bike trainers since the rear tire is removed entirely and the frame is connected directly with the trainer. You’ll able to step up your efforts while remaining completely engaged with smooth pedal strokes during your workout without the occasional hiccups that are found on the wheels on design. Keep mind that while you can do hard efforts on the direct drive trainer, you don’t want to be sprinting or doing any off the saddle pedaling on it to minimise the risk of damaging your bike frame, especially if it’s carbon! The convenience of smooth power transfer comes at a price. Direct drive trainers are much more expensive than wheels on trainers because of their increased technological features. Direct drive trainers are also more cumbersome because of their more intricate design. This added weight makes storage and transport more difficult. PRO TIP : Direct drive trainers are ideal if you’re looking to do sustained, medium to hard efforts training. Fluid trainers offer resistance by implementing an impeller (blade) within a bath of liquid. As the wheel speed increases, so does the resistance. Fluid trainers mimic resistance that riders experience when riding outdoors because the resistance is variable. If you spin in an easy gear, the fluid trainer offers little resistance, but if you jump into a harder gear, the resistance will quickly build up. Manufacturers of fluid trainers generally utilize thermodynamically neutral fluid, such as medical grade silicone, so that the fluid doesn’t absorb heat while you ride. This keeps the resistance you produce at a consistent level, every time. Connected to the fluid chamber is the drive system. This is either directly plugged into the chamber or magnetically attached. The drive system consists of the flywheel and a roller for your rear wheel to coast on. As you pedal and increase your power output, the fluid system works simultaneously with the drive system to create that real-road feel. 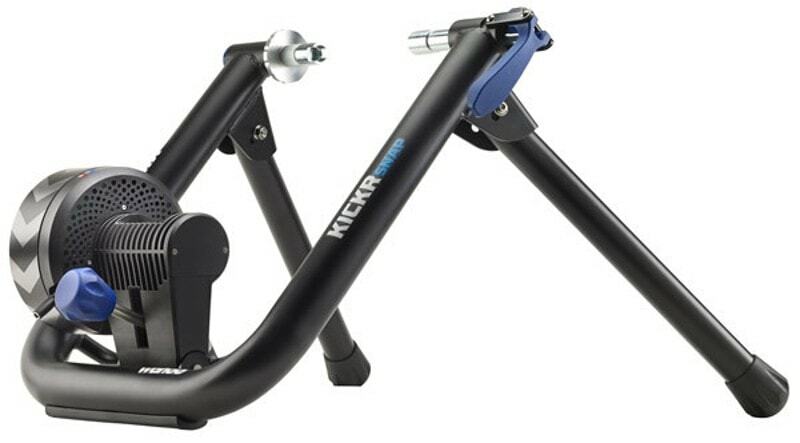 The Kurt Kinetic Rock and Roll is one of the most popular wheels on bike trainer that uses fluid resistance. Magnetic trainers generate resistance by spinning a metal disk through a magnetic field. This magnetic unit creates a drag on the rear wheel as it turns from your power output. A magnetic trainer’s drive unit consists of a flywheel with opposing magnets that replicates the momentum of the rider on a bike and a roller where the rear tire spins. The metal disk that spins through the magnetic field is affected by what is known as an Eddy Current. This current is what is responsible for the drag that’s produced on the rear wheel, effectively creating resistance. Magnetic trainers produce high amounts of heat throughout a workout session. As heat increases, resistance decreases. 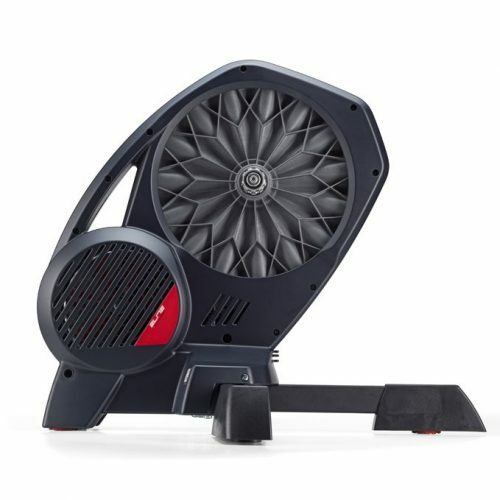 Some magnetic trainer models offer small fans to dissipate heat to keep resistance at an optimal and realistic level. The Elite Novo Force is a good example of a premium magnet based trainer. 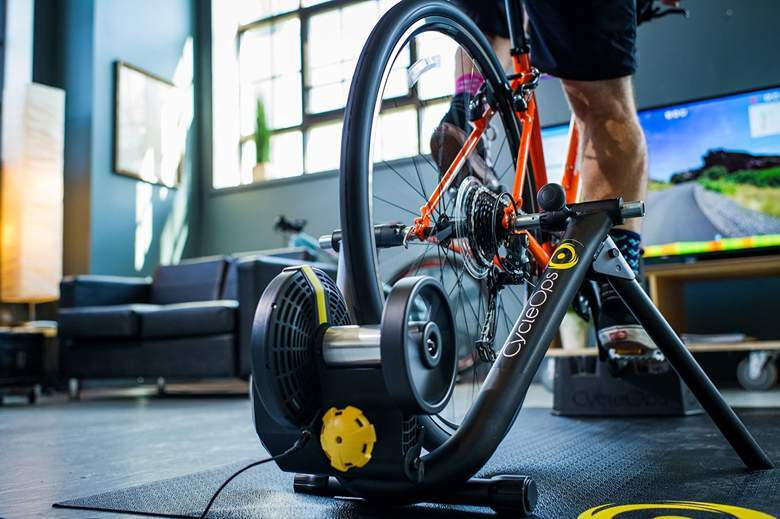 Wind trainers are possibly the most basic design when it comes to indoor trainers. Wind trainers create resistance by creating air. The roller that the wheel spins on is connected to a large disk that consists of blades. As the rider produces power, the blades spin and creates wind resistance. As the rider pedals, the resistance remains progressive. These models are known to be extremely loud due to the wind generated, especially during high-intensity efforts. The resistance offered by wind trainers does have a limit once higher power-levels are reached. The fans can only provide a certain amount of resistance, which makes them best for endurance-like efforts. Smart trainers provide dynamic resistance through the use of sensors located on the trainer. These sensors communicate with apps on your phone or laptop and give you the most realistic resistance according to the specific parameters that you choose. How does smart trainer work? Resistance works through the power meter located inside the smart trainer. The smart trainer broadcasts all data to your preferred app, such as Zwift. If you’re riding up a 10% grade in the virtual world of Zwift, the app communicates this to your trainer, and it automatically makes the resistance similar to its algorithm. If you begin riding downhill, the smart trainer releases all resistance, and you must shift accordingly to regain any resistance to increase your speed. Through smart trainers and their associated apps, users can choose to set training plans of set power ranges. If a user desires to train at 200 watts for one hour, the electromagnetic hub locks in at 200 watts and gives the specific resistance automatically, no matter how hard you pedal. Most smart trainers are direct drive based, and resistance is produced in its electromagnetic hub. This electromagnetic hybrid creates a low decibel and heat resistant atmosphere. The most popular smart trainers in the market today for Zwift are the Wahoo Kickr and Tacx Neo. When looking for a bike trainer, you’ll need first to check if the trainer is compatible with your current bike. Knowing beforehand if a bike trainer is compatible is the difference between starting your indoor training immediately or being frustrated staring at a trainer that you can’t use. Generally, wheels on trainers can fit almost all bikes, regardless whether its rim or disc brakes. If you’ve a bike with disc brake, you might want to check if it’s supported. For a bike with disc brakes, you’ll need a trainer with thru-axles as the method for mounting it. PRO TIP : Most new (post 2017) direct drive trainers can support bikes with rim and disc brakes through the use of adapters. Noise levels play a significant role when considering which bike trainer to buy. This is because not all bike trainers are created equal, and not all living situations allow for loud trainers. The quietest type of trainer is the fluid-based trainer. The thermodynamic fluid located within its chamber doesn’t retain heat, which keeps the noise at a minimum while you’re on your trainer. This style is a must if you’re living in a small space or others around you need peace and quiet. The second quietest type is the magnetic-based trainer. Although these generate heat and necessitate a fan, the noise produced is manageable. If you don’t need absolute silence but also want to hear your surroundings, then a magnetic-based trainer will do just that. Since magnetic trainers are in the middle, it’s up to you to consider all other factors if you’d like to spend a little extra to get the benefits of a fluid trainer. The loudest type of trainer is the wind-based models. These produce resistance through large fans that create wind. If your living situation allows for high decibels, then this is an option. Although more recent models are becoming quieter, they are still the loudest option. PRO TIP : Noise level increases as you go from fluid to magnetic and wind based bike trainers. The lightest option is the wind-based trainer. This trainer style weighs the least out of the others because they are based on a straightforward design. The disc with blades also acts as a flywheel, so there are fewer components that add weight. In the middle is the magnetic-based trainer. These offer flywheels and a magnetic hub that produces resistance. The heaviest option of the three is the fluid-based trainer. These tend to be the heaviest because of the fluid located within a chamber to offer resistance and reduce heat absorption. PRO TIP : Weight increases as you move from wind to magnetic and fluid-based bike trainers. Just like in the previous category, weight plays a significant role in a trainer’s size and ease of storage. Anyone considering a bike trainer should think how they’ll store their trainer after a training session. Wind-based models are smaller and easier to store. The vast majority of wind trainers can fold up for easy packability. Magnetic trainers are once again in the middle. These trainers are usually foldable, but due to their added components, their size is larger than the wind-based trainers. Fluid trainers are slightly larger than magnetic trainers and therefore are third in this category. These trainers are generally foldable so storage is very possible, but its additional weight doesn’t allow for the highest marks in size and storage. Price is possibly the biggest factor to consider before buying a trainer. Some of us are on a budget, whereas others don’t mind the price at all. Depending on where you land on this spectrum, this category will determine which model you’ll eventually buy. When it comes to bike trainers, one thing is sure: the more features available equates to a higher price. The pinnacle in price lands can be found with smart trainers. These have endless functions and features and have a significant price tag to match. 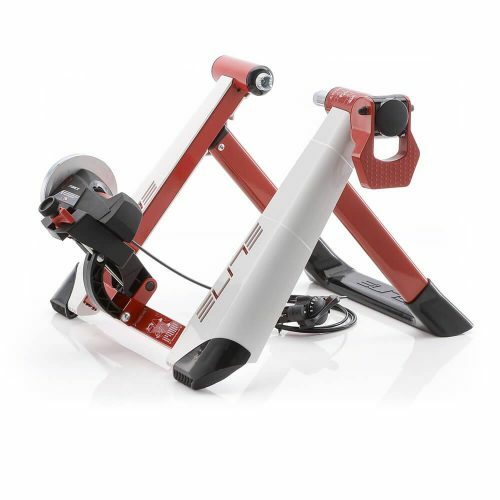 Beginner to mid-level smart trainers like the Elite Direto usually start from $700, while some high end models like the Wahoo Kickr and Tacx Neo are in the $1,000+ range. Fluid trainers are the second most expensive models, third are magnetic-based models, and the least costly are wind-based trainers. PRO TIP : Expect to pay upwards of $700 for a smart, direct drive trainer.